It's a way for you to earn more Google Play Rewards. 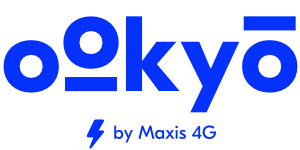 Earn up to RM 125 Google Play credit when friends sign up for ookyo with your referral code! Get more friends to get more rewards! Track your progress and how much you've earned via the app! If you've got 1 or 2 active friend(s), you'll get the Starter level one-off RM 5 Google Play reward when your plan renews. If you have 3 or 4 active friend(s), you'll get the Semi-Pro RM 5 Google play reward when your plan renews. The following renewal if you still have 3 or 4 active friend(s), you'll get the next RM 5 google play reward. You'll continue to get this reward as long as you're in this level and have not received all 4 x RM 5 Google Play reward. If you have 5 or more active friend(s), you'll get the Champ RM 10 Google play reward when your plan renews. The following renewal if you still have 5 or more active friend(s), you'll get the next RM 10 google play reward. You'll continue to get this reward as long as you're in this level and have not received all 10 x RM 10 Google Play reward. Your friend must key in your code when they register otherwise it won't count. They can't provide this details after registration.